I have to say, I appreciate the medias attention to insect science no matter how distorted it gets. But now that the news storm has settle we can point out some other good news about Rabeling, Brown, and Verhaagh’s paper. News that may not make for a good newspaper headline but that are nevertheless relevant to specialists in ant systematics. Martialis heureka is the first ant species to be placed into our existing scheme of classification for the ant family in a strict phylogenetic way, with the use of quantitative methods, since the publication of the large scale phylogenetic projects for ants by Moreau et al. (2006) and Brady et al. (2006). That is, we now have a system in place, with enough molecular markers across enough ant taxa, that makes possible taking an ant species from which we know nothing about and “plug it in” to find out its evolutionary position relative to the rest of the family. These are good news also because it shows that the large scale Tree-of-life efforts for Formicidae are working as intended: rather than been the final saying about ant phylogeny, they created a platform from which our taxonomic knowledge can grow phylogenetically as more species are added to the pool of data. One can agree or disagree about M. heureka position as sister to the rest of extant ants (I have my reservations, subject for another post), but that is beyond the point. The data is there and the methods are transparently laid out for anyone to scrutinize, reproduce and tinker with if so one wishes. This contrast with the still common way of doing taxonomy base of notions of overall similarity or favoring some characters over another without a clear method. These taxonomic decisions can be very well informed guesses, made by specialists with decades of experience, but they are guesses nevertheless, and as such difficult to assess (or challenge) by the rest of the community. Not all is glossy though. The paper on M. heureka also highlights a big piece that is missing in our system: morphology. Our vast knowledge of ant morphology is not yet structured into a coherent system equal to the molecular one. Ideally, such system would allows us to plug-in a species by comparing its anatomical features to a pool of existing morphological data, score characters, and combine it with molecular markers for phylogeny reconstruction. The impact of this vacuum is apparent in M. heureka‘s paper. 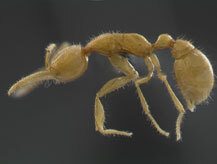 What constitute unique derived features in this species and which ones are shared primitive (and potentially ancestral to all ants) remains speculative- surely those specialized mandibles (unique among ants) are derived, but it is not clear that having one tibial spur per leg (as opposed to two) is an apomorphy for this lineage, for example, since this character occurs on and off scattered across the family. Such uncertainty greatly impacts our attempts to reconstruct how ants first evolved and how they looked like, even when we have what seems to be a vital piece of the puzzle. And I am not even bringing up the f-word. All in all, ant systematics seems to have gotten into great shape in the last couple of years and the publication of M. heureka by Rabeling and coworkers is a welcome attest to this. Welcome to the blogosphere, Roberto! Speaking of the F-word, can I ask your opinion about the relationship between Haidomyrmex and Martialis? Alex- I had not think about Martialis in the context of Haidomyrmex until you mention it. 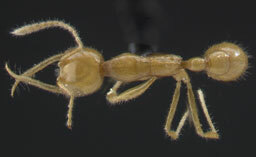 It is true that there are a few ant fossils from the Cretaceous with elongated, slender and toothless mandibles (think Brownimesia also), and that Haidomyrmex also shows a very conspicuous brush on the clypeus. But other than that I don’t see much similarity between these two genera. Even in those two features they are different. Unlike Haidomyrmex (or Brownimesia), the mandibles in Martialis does seems to have (in my opinion) marked masticatory and basal margins: look at the concave areas in the distal half inner margins. Haidomyrmex clypeus is quite broad and the antennal sockets are not close to the anterior border of the head capsule. Also, compare the mesosoma in profile. Martialis has a uninterrupted smooth dorsal profile, much like amblyoponines do, wherereas in Haidomyrmex the pronotum, mesonotum and propodeum each seems to form domed structures. Of course this assessment is base on what little I can gather from Dussky (1996) and Engel and Grimaldi‘s (2005) publications, since I have never examine the specimen first hand (nor Martialis for that matter). In any case, this is one of my concerns about ant morphology and phylogeny- we have many interesting ant fossils that cannot be placed into any of the extant subfamilies, yet they are important to understand the overall picture of early ant evolution. And molecular markers can’t help us here.